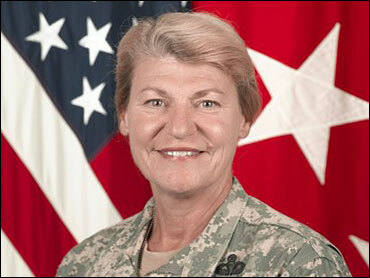 From its humble beginning 33 years ago at an Army post in Oklahoma, the career of Ann E. Dunwoody ascended Friday to a peak never before reached by a woman in the U.S. military: four-star general. At an emotional promotion ceremony, Dunwoody added a fourth star and, looking back on her years in uniform, said it was a credit to the Army that she was given a chance to rise through the ranks in a male-dominated military. "Thirty-three years after I took the oath as a second lieutenant, I have to tell you this is not exactly how I envisioned my life unfolding," she told a standing-room-only auditorium. "Even as a young kid, all I ever wanted to do was teach physical education and raise a family." Later, at Fort Belvoir, Virginia - her birthplace - Dunwoody was being sworn in as commander of the Army Materiel Command, responsible for equipping, outfitting and arming all soldiers. Just five months ago, she became the first female deputy commander there. Dunwoody, 55, has made it clear that she feels no need for special acclaim for her historic achievement. "The recognition makes her a little bit uncomfortable from the standpoint of the gender aspect - that we're making a big deal (that) she is the first female general officer," Bryan Whitman, a Pentagon spokesman, said Thursday in announcing that Defense Secretary Robert Gates would attend her promotion ceremony. When she was nominated by President George W. Bush in June for promotion to four-star rank, Dunwoody issued a statement saying she was humbled. "I grew up in a family that didn't know what glass ceilings were," she said. "This nomination only reaffirms what I have known to be true about the military throughout my career - that the doors continue to open for men and women in uniform." She also told an internal Army publication, "While I may be the first, I know I won't be the last." There are 21 female general officers in the Army - all but four at the one-star rank of brigadier. It was not until 1970 that the Army had its first one-star: Anna Mae Hays, chief of the Army Nurse Corps.